The Beez' speaks..: World Wildlife Fund .wwf format cracked! World Wildlife Fund .wwf format cracked! I heard about the new .wwf format this morning. 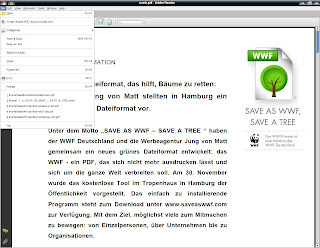 It is an initiative of the World Wildlife Fund to prevent people printing PDF files. As a matter of fact, it is an encrypted PDF format with the "printing" flag disabled. Of course, everybody wants to save the environment. I, for instance, print very little. I have a Linux BeBook to carry my documents along when I attend meetings and my ancient HP Laserjet 4p is on its second cartridge. But I don't like it when people are forbidding me something. It is sending the wrong message. Just like that 10:10 campaign which suggested that if you don't participate, you're up for elimination (yes, you can try to eradicate this movie from the web, but so far I've always been able to track it down again. But keep up the good work, I love outsmarting you!). So I set out to crack it. First step, I simply opened it with KGhostview. You may use any GhostScript viewer for that matter, but this one was simply available. Surprise, I was able to print it right away. Still, this only fixes the problem for the receiver of the file. If you want to send it to someone else and enable him to print the file, the problem remains. 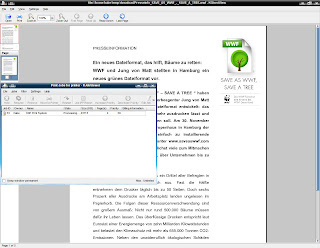 The resulting file is a true PDF and fully printable. In the meanwhile, I've embedded this procedure in the .wwf toolkit, so if you happen to use Linux or Windows you're lucky. Ok, now go figure another way to save the world. This is certainly not a good thing to spend your donors money on. Update: This WWF gadget becomes more pathetic by the minute. Many wonder why they didn't bring out a Windows version. Easy, the output is generated by the default OS/X 10.6.4 Quartz PDFContext engine. Windows doesn't feature such an engine, so they would have to add one. The few FOSS Windows PDF writers I am familiar with all use the GhostScript engine, so keep your eyes open. We might have a GPL violation on our hands before we know it. I always loved Penn & Teller! With regard to your WWF file format. You need to be aware that this "file format" is in fact merely an encrypted .PDF file, with the print flag set to false (so the document can't be printed). What you should also be aware of is that any documents saved in this document "format" are trivially printable. All one needs do is open the document use The Free Open Source Software application GhostScript on Linux, and print the document. GhostScript by default ignores the Print Flag, and allows all documents opened with it to be printed. You should also e aware that most of the free (as in no cost) PDF viewers for Mac and Windows, use the Free Open Source GhostScript back end, so they too will ignore the Print Flag. If you really want to make a strong statement about conserving trees, reducing landfill (with toxic waste, like old computer parts) etc. Start promoting strongly the use of Free Software (FOSS) and the Linux Operating System for personal Computers. Free Open Source Software and particularly Linux based Operating Systems (such as Fedora, Ubuntu, Linux Mint, Mandriva, openSuSe, PCLinuxOS, etc) are exceptionally Eco Friendly, because unlike their proprietary counterparts they do not arbitrarily change in ways that require, for example; the purchase of a new computer, thus making the old on redundant, and no longer usable (and eventually having it scrapped, and the parts sent to landfills), because Linux based Operating Systems will still function well, often exceptionally, on computer hardware that is 5 or 10, or even more, years old - that's a lot of computer hardware that would otherwise have ended up in landfills, and it's a lot of computer hardware that doesn't need to be manufactured. Our (myself and my friends) support of WWF is now, in light of your wastage, and frankly, quite silly solution to reducing deforestation, contingent on your actually doing and recommending sustainable, and effective means of reducing deforestation and toxic landfill. Please consider this letter carefully. I honestly hope this is the end of this fruitless initiative. Update: Obviously, the administrator of the Facebook page cannot distinguish between making it and breaking it. To prove my point, I posted a valid .wwf file, made by using standard Linux tools. "Wired" also mentioned it, not too favorably. Read the comments on that page for yourself. That's what it's all about. Of course you can specify that a PDF cannot to be printed. However, many people are not familiar with this feature. But those who are not computer savvy should be made aware of their choices. It's about as ethical as a car manufacturer who disconnects a cable to "raise awareness" of carbon emissions. Real petrolheads can reconnect such a cable in an instance while ordinary users are left frustrated. Deliberately preying on the ignorance of people is simply despicable. Update: People are wondering why I did it and why I'm so persistent. Everywhere charity organizations like WWF are getting less donations. Consequence is that they're getting more aggressive and are shoving their ideology down our throats. 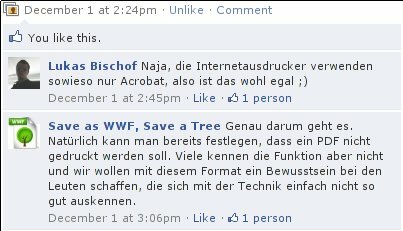 It may be obvious that the ideas of WWF in this respect and FOSS are incompatible. It is the duty of the FOSS community to expose this scam and provide alternatives to give users back the control over their computers, so they can use it in any way they see fit. Furthermore, it exposes how the WWF are using their precious funds for a cause that is highly debatable in itself. We hope this will deter other organizations to walk similar paths. Update: There have been unconfirmed messages on the Facebook page that the OS/X version of the WWF driver "phones home". Is the WWF spreading spyware? And if it isn't, why doesn't it ask permission first - like any decent program? Update: It is confirmed by WWF that the OS/X driver "phones home". Allegedly only to check for a new version. The program did not explicitly ask permission when it was installed, neither did it inform the user in any way, form or shape of this behavior. It cannot be disabled. Finished. The world is safe again. If you're lucky.. If not, maybe this helps. 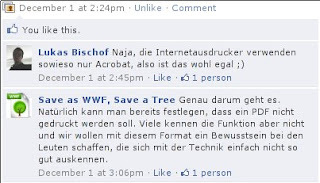 Update: Bad news for the "Save as WWF" campaign. According to Printweek.com it has caused a rift within the WWF itself. WWF International director of corporate relations Maria Boulos warned that the campaign was "misleading" and might "cost them a partnership in France". Boulos requested that the english-language site be shut down "immediately and temporarily" until the necessary amendments could be made. Update: Yup, it has entered Wikipedia, featuring yours truly. Note I had nothing to do with it. Just added a few missing citations. just a note: regardless of how easy it is to crack it, everybody concerned with the environment and/or Free Software should know that the WWF format is an intrinsically dumb, anti-environment idea. If you care about the environment, use Linux! Yeah, and use Linux on old computers, like my eight year old laptop. It's easier to plant more trees than figure out what to do with billion of tons of computer parts. Oh, I think I understand the idea pretty well: if people don't voluntarily print less we'll force 'em by introducing some DRM scheme. DRM is not just evil, it is counterproductive, because the cracked version has better value and gives more freedom than the original. Hence, it must be broken before it spreads. Retards usually do not have the skills for a hack like this. I'm always grumpy. This morning was no different. That's pathetic. I can't believe they spent funding dollars on that. There's really no "crack" or "hack" going on here, that's what makes it so sad. They should be promoting (and promoting only) the proper use of electronic formats and printing practices, not enforcing them. To protect to forests, e-readers could become the best alternatives to printing. This kind of organization should promote the use of e-readers. If organizations want to contribute with software development, they should work on increasing the usability of e-readers. And the product of this development should better be free software. Those that're claiming The Beez is being "retarded" or missing the point are actually the ones missing the point. 1) It does NOTHING, contrary to the claims to the otherwise, to prevent people from printing things out. 2) The reality is, unless we have something like high-performance e-ink or OLED displays coupled with the next generation of something like ARM's Cortex A9, your carbon footprint for doing this is actually HIGHER than doing the printing. It's a foolish feel-good thing that doesn't account for the facts as they are on it- and tries to foster falsehood as truth, because it lets the people who came up with the idea "feel good about themselves and what they're doing for the environment". To be sure, WWF has done wonderous things for the environment, and I hope they continue- but it needs to make sense and actually accomplish something other than call attention to a problem and make a half dozen as bad or worse problems for itself. WWF file format does this sort of thing. 1) Growing trees takes several years before they can be harvested. Increasing recycling rates/efficiency can go faster. If demand increases, recylcing paper prevents the price of paper to increase a lot. Without recycling, the already "harvestable" wood in a rainforest would increase in value making the rainforest trees more likable to be cut down for paper production. 2) The energy required to recycle paper is lower than the energy required to create paper from trees. Please remember that the argument the video makes regarding the transport energy is very poor...or do people in your country throw their garbage in their gardens? The point is that you *always* need a transport. Either to a landfill, to an incinerator, or to a recycling station. In fact there is a higher chance to reduce transport pollution with recycling: in a very urbanized areas there is no room for forests so you will have to transport "fresh wood fibers" from remote areas whereas there are plenty of "used paper fibers" closeby. I appreciate you took all this time to debunk it, but the truth is that it seems to me to just be a marketing initiative to get people to think before printing. Did that never come across your mind? So because you set out to debunk it and the fact it is getting so much press, proves to me that their marketing idea worked! Everywhere charity organizations like WWF are getting less donations. Consequence is that they're getting more aggressive and are shoving their ideology through our throats. Wanna save trees? Don’t Save As WWF. This is the really green format! And so what? 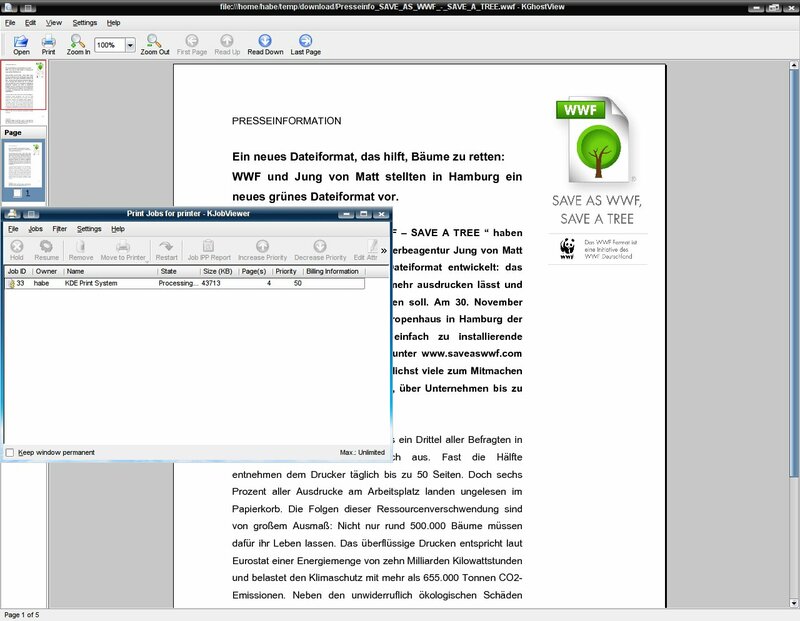 I haven't ever downloaded a PDF from WWF, I doubt that most people download PDFs from the WWF, and I doubt that most people care about the WWF except for when the org enters the news. I'm also confused by how an NPO "forces" or "shoves" this custom file extension upon you, since it isn't a government, for-profit corp or a litigious body; in fact, it is one of many pro-green NPOs around the world to which you can donate your money if the WWF displeases you this severely (although I doubt that you donate or have much prior interest in the WWF save for this stunt, considering the current state of your blog post). Again, I'm really weirded out by "force" and "shove" by a non-government, non-religious, non-litigious activist group of whose actions I rarely hear about and does not have any power of standardization or protocol. The WWF isn't a government and doesn't bear any sort of arms, so its technically not capable of force. If it were the intention of the WWF to limit the use of .WWF to its own organization, you would probably be right. But that is not the truth, watch their video (included in this post) for yourself. They want it to proliferate over the entire IT ecosystem. And then you get on my turf. Don't tell me that all NGO's are toothless, nice, peaceful panda bears. They are multi-billion dollar companies and have significant influence. And like any company, if their existence is threatened they will take measures. I don't believe for a second that the deforestation depicted in the clip is an "accident". They know very well that pulp is made from tree forests and NOT from the trees in the rain forest. So I don't know whether you are naive or really dim, but that is the story. Charities like the WWF have their own agenda and they WILL use their media and political influence to let you do what THEY want. I'll see you back next time you want to print a .WWF page and you can't. Because the FOSS community is the only thing that stands between you and them. Our gipsyes still chopping trees happier than ever. So not this silly thing will save the trees. For your sake, I really hope that wasn't the actual letter you sent. It is full of grammar and spelling mistakes. It really comes across as ignorant. If someone actually read it, they most definitely had a chuckle and recycled the paper it was written on. Also, you are being misleading about the so-called "rift" at the WWF. Ms. Boulos is the director of corporate relations. That means her job is to please outside corporations. Also, please remind your readers that the email is only "allegedly" from Ms Boulos. I'll stop short of explaining how Penn and Teller also do not tell the whole story. Another time perhaps. Anyone can pick and chose data points to rationalize their own postulations, just not everyone has funny music and a magic act to turn self-professed skeptics into credulous sheep. Beez, you're just like the secretaries in your office, you'll believe anything you hear or see, as long as it fits in with your preconceived world-view. No, I didn't write that letter. I'm not that kind of a blogger (making his own news). Personally, I care more about DRM than I do about trees. Teller and Penn may not be telling the whole story, but neither is the WWF. Furthermore, I must admit I'm not really interested in your opinion about me. Fair deal? Good article. I installed the wwf software thoughtlessly on my macbook and now I cannot print a single file from any application because the printer says it doesn't have permissions. 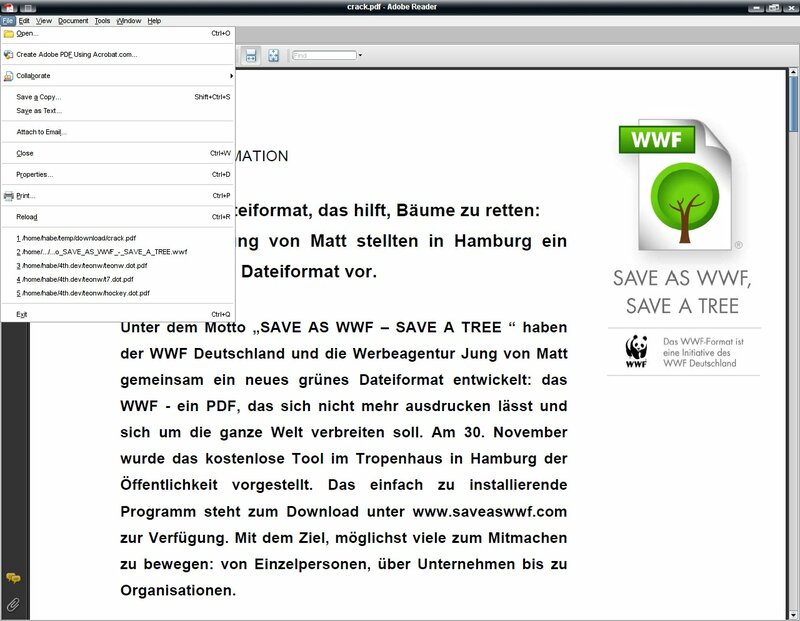 I've deleted the SAVE_AS_WWF.app but cannot find the pdf services file anywhere. Any other methods for uninstalling this garbage? Sorry pal, I picked these instructions from their Facebook page. I don't have a Mac myself, so I can't even begin to figure it out. Note that the firm who made these "drivers" is known mostly for creating.. websites! All in all they are slow to respond. No update has been made to both drivers since their release. And the Windows version needs one even more than their Mac version. Every time an issue arises their response is the same: "Thank you for that! We will relay that to our technical team." Needless to say, nothing happens. When you address them, you're "against the environment". Nuff said.. Next time wait for an Open Source equivalent. I know this is "mosterd na die maal", but I had to share this with someone. I downloaded your demowwf.wwf file, changed the file ext. to ps & saved it as a PDF file using PDFCreator. No cracking/hacking/scripting required. And it's printable on a PC running Windows XP & 7. I'm an IT service management consultant, working for a major IT consultancy company. I'm also a regular columnist for the Dutch "IT-Infra" magazine. I've been developing system and application software for almost thirty years, both professionally and privately, both proprietary and open source. 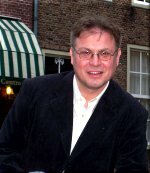 I'm also the (co)author of several books, both fiction and non-fiction. I'm living together with my girlfriend from France. The views expressed herein are my own and do not necessarily represent the views of my employers or clients.